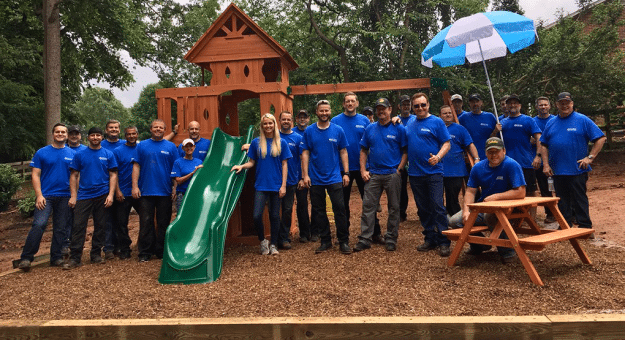 On Wednesday, May 30, Richard Childress Racing and ECR Engines partnered with the Roc Solid Foundation to build a playset in Clemmons, North Carolina for a young girl diagnosed with pediatric cancer. The Roc Solid Foundation, founded in 2009, builds hope for children battling pediatric cancer through their Pay It Forward initiative. This initiative builds playsets for children ages 1-8 and completes room makeovers for children ages 8-18. Abby, who will celebrate her third birthday next Tuesday, June 5, has been diagnosed with Acute Myeloid Leukemia. Wednesday morning, Abby left her home in a limousine for a fun-filled day out with family and friends. In her absence, team owner Richard Childress, RCR President Torrey Galida, drivers Ryan Newman and Austin Dillon, and many other RCR team members worked to build the playground right in her backyard. When Abby returned home, the volunteers sang her happy birthday and surprised her with the finished product.